Oil, assemblage and collage of objects on canvas. The name Dada first appeared in Hugo Ball’s magazine Cabaret Voltaire, published in Zurich in 1916, to define an irrational, provocative art that employed unorthodox techniques. It soon spread through many other European cities such as Berlin, Cologne, Paris and Hanover. 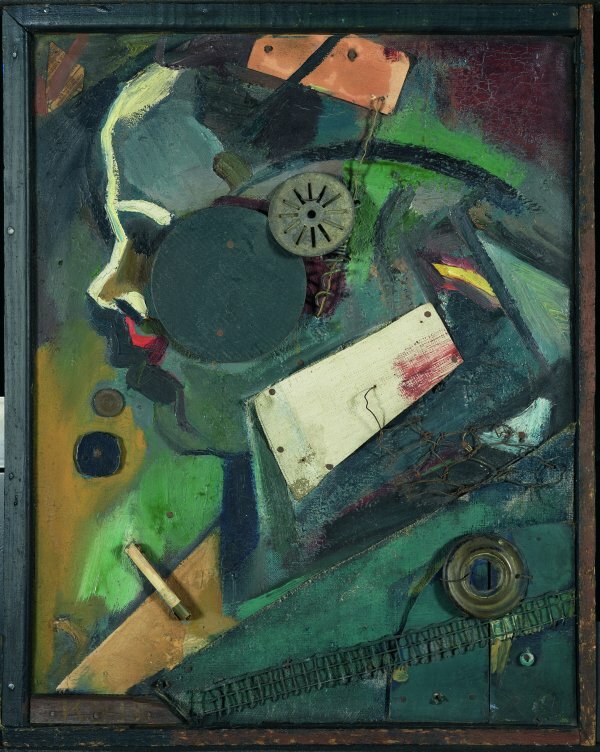 The Hanover Dadaist group was headed by Kurt Schwitters, an artist who, although inspired by the revolutionary atmosphere of post-war Germany, was more in tune with the values of constructive abstraction than with the subversive politicisation of the Dadaists. Through his collages and assemblages, generally entitled or subtitled Merz, Schwitters aimed to achieve an artistic synthesis, a new aesthetic order using waste products, convinced — to quote his own words — that “one can even shout out through refuse.” The artist had invented the word Merz by chance when he cut it out of the longer Kommerz, which had fascinated him for its sound. Merz was a blend of the Dadaist pursuit of irony and paradox through the transformation of objects and the Russian avant-gardes’ notion of art as construction. It also drew from Cubist collages, although unlike the objects the Cubists incorporated into their compositions, the materials Schwitters employed in his works were not representations of external reality but mere signs; they had no value in their own right, only as integral parts of a composition. Merzbild 1A (The Psychiatrist), executed in 1919, is an early example of the formal structures of the Merz compositions and combines texture and colour with various geometrically shaped objects. According to John Elderfield in his monograph on the artist, it is one of the earliest Merz pictures, if not the first, and was most likely shown in Schwitters’ one-man exhibition at Der Sturm gallery in Berlin in July 1919, the date that his text “Die Merzmalerei” was published in the magazine by the same name. The inscriptions Schwitters made on the stretcher dating the work to 13 February 1919 and numbering it “1A” back this hypothesis, which, if correct, would make Merzbild 1A (Der Irrenarzt) Schwitters’ first Merz composition.